Are you a Starbucks fan? If so, when was the last time that you stopped in to a McDonald’s or Dunkin’ Donuts to get a quick cup of coffee while you were out and about? A new study by CustomersDNA surveyed the coffee and breakfast buying habits of 15,000 fast food customers. The survey found that more than 50% of regular Starbucks and Dunkin’ Donuts customers regularly visit other businesses for their morning cup of joe, while just 29% of regular McDonalds customers venture to a Starbucks or Dunkin’ for a coffee. Starbucks still makes up most of its sales with coffee, while McDonald’s coffee sales only make up about 6% of its total. Still, it is interesting to see these trends and think about what drives us to make our coffee choices. The owner of the company that conducted the study noted that Dunkin’ tended to have the cheapest price for coffee, while McDonalds was slightly more and Starbucks slightly more again, but said that the study didn’t ask consumers to identify what made them choose one business over another. My theory? A combination of price, convenience and quality is going to drive most consumers. If you are looking for a specific type of coffee and don’t mind having to wait in line for a few minutes behind people ordering lattes, you might choose Starbucks. 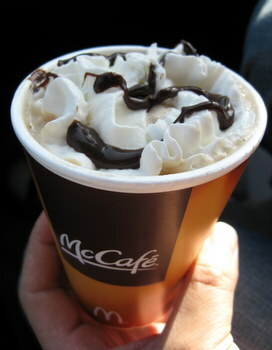 If you’re in a rush or just need a quick cup of coffee, you might drive through McDonalds for a cup (and their coffee is quite good) instead of stopping into another coffee shop. And yes, my theory is based on some real-world research – after all, that is often what I’ll do!